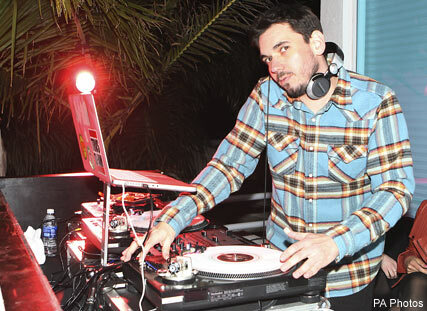 DJ AM’s ex-fiancée, Nicole Richie, was just one of the stars who attended his funeral yesterday, alongside musicians Travis Barker, Joel and Benji Madden. The celebrity deejay, real name Adam Goldstein, was laid to rest at the Hillside Memorial Park and Mortuary in Los Angeles surrounded by a small group of close friends and family. A memorial is due to be held this evening at the Hollywood Palladium, in ‘the style of an open 12-step meeting’, according to the invite. Goldstein, who passed away last Friday, did not leave a will and his mother, Andrea Gross, has been forced to file letters of administration with the Los Angeles County Superior Court to have herself named sole heir of his estate, which includes some $3.5 million-worth of property and $400,000 personal assets. However, with debts of around $2.9 million, his net worth stands at approximately $1 million. Although the coroner has recorded an inconclusive autopsy result, it is believed Goldstein died of a drugs overdose, whether it was accidental or intentional remains a source of intense speculation.